One of the secrets to many of the successes in the NHL lies in a player’s backyard growing up. Professional players got a huge advantage as kids if they had a rink, full size or miniature, by their house where they could play and practice from an early age. The example of Mario Lemieux, whose father built a rink for Mario and his brothers, demonstrates how valuable this personal time on ice can be. 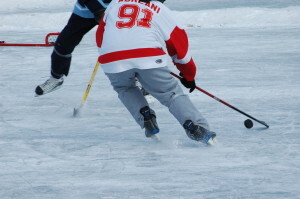 If you’re lucky enough to have a personal rink, or one that’s close by, here are a few drills to hone your hockey skills. Being able to shrug off forecheckers and dance through a defensive system will go a long way toward creating quality-scoring opportunities. Shifty skaters have to put in hours of practice on their quick turning ability in order to make it look seamless. For a basic drill that helps with skating agility, put four cones on the ice, one on each blue line, one on the red line, and one at the far end faceoff circle —each staggered to be several feet to the left and right of one another. Begin at the top of the other faceoff circle, skating down and crossing over to skate back up the middle. Maneuver around each cone on the center ice lines, crossing from left to right, then circle around the cone at the opposite faceoff circle. Perform the drill both with and without the puck to get a better feel for acceleration as well as stickhandling. You miss 100 percent of the shots you never take, said Gretzky, which is why a player’s shot is one of his best attributes in hockey. Whenever possible, practice your shot with someone feeding you pucks so that you can develop soft hands and catch passes, but several solo drills can give you a killer release. The most practical shooting drill is also the most simple: Take as many pucks as possible at every angle in the offensive zone and aim for the cross bar of the net since the red paint provides a solid shooting guide. After shooting from every spot on the ice — in the slot, at the faceoff dot, from the side boards, and from the point — start to aim slightly lower, just beneath the crossbar, so that you can hit the shot right where the goalie can’t stop it. Follow the example of 60-goal scorer Steven Stamkos and shoot a lot: Stamkos credits his lethal release to shooting 300 to 400 pucks a day. The paint on a rink surface will go a long way toward helping a player stickhandle through traffic. 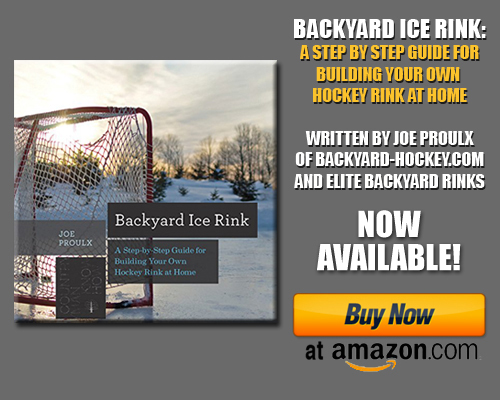 A backyard rink may not have the same complex paint job as an NHL rink, but even a single red line allows you to train your stickhandling by passing the puck over each side of the line. Add cones on either side of a paint line to practice pulling the puck in between obstacles; practicing this in the faceoff circle provides the benefit of stickhandling while turning and while moving toward a new point on the ice. Put a cone in front of the net to practice toe drags, pulling the puck from the tip of the blade to the heel of the stick in order to evade a poke check and unleash a deadly snapshot on an unsuspecting goalie. Drill with a buddy to send a pass over all parts of the ice. Start a simple drill with both players behind the net and skate upward, passing the puck at each go, alternating between long and short passing. Work on saucer passing to elevate the puck when farther away and backhand passing when closer. Have one player skate ahead to catch a breakout pass, then pivot and wait for the other player to reach the attacking zone before passing. Once both players are in the attacking zone, lengthen short passes until both players are near to the net on either side so that the goalie must commit to one side of the net or the other. About the author: Erin Wozniak is the Director of Marketing at Pro Stock Hockey , an online supplier of pro stock hockey equipment. Erin is a devoted Blackhawks fan and is passionate about hockey. Pro Stock Hockey offers products including skates, protective equipment, hockey sticks and more.